He instructed them to take nothing for the journey but a walking stick.… The simple walking stick — not the fancy, manufactured poles you can buy in a sport goods store, but a wooden stick — is a beautiful symbol for the commission we all have to bring the good news to people. It is a humble thing. You don’t have to be rich or powerful or brilliant or beautiful or articulate to have a walking stick. In the Gospel reading today (Mark 6:7-13), the disciple apprentices of Jesus are sent out to preach and heal as he did. They will have only their commitment to Him, their experiences of Him to share, remembered words He said to repeat, and the commission He gave them. People they encounter will be free to receive their authentic selves and their words, or reject them. We have everything the disciples had to work with as we do what Jesus asks of all his disciples: to bring other people the gift of knowing Him and following the Jesus Way. 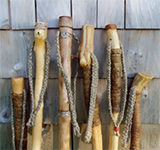 We have our own spiritual walking sticks. What’s stopping us?